Freelance Copy Editor: Herald Newspapers – Richner Communications (October 2016-present), Rapaport Diamond Report (Summer 2011, Winter 2000-Summer 2006), The Conference Board’s Across the Board (2001-2008), Breathe magazine (July-August 2004/premiere issue and December 2004-January 2005), Bell’Italia/Beautiful Itineraries magazine (September 2003-2006), TV Guide (Winter 2000-August 2000), Self magazine (December 1999-July 2000), Nylon magazine (Spring 2000), Graphic Image (1997-2000) and Dance Online (1996-1998). Freelance Writer (June 1999-present): Current and past clients include: (article writing) Cahners Business Publishing, Small Business Opportunities, Income Opportunities; (ghost writing financial books) Palisades Press; (web content writing) Think Inc., APB.COM, Ontone.com-products editor. Extensive freelance writing credits include publishing trend pieces and reviews for The New York Times Book Review, The Daily News and American Bookseller; features for Long Island Bride & Groom, Car & Travel, Allure, Destination Weddings & Honeymoons, Family Circle, Natural Living, Elegant Bride, WIT and Working Woman; news articles for Newsday, Time Out New York, Stagebill, The Christian Science Monitor, Construction Equipment Guide and Good Dog. Managing Editor (September 1998-June 1999): Handled all day-to-day functioning of the magazine. Acted as a central liaison between editorial and art departments and production. Supplied creative input to each issue. Paginated magazine. Line edited all articles and blue lines. Developed, researched and wrote articles. Wrote coverlines and captions. Delegated writing assignments to columnists, freelancers and other editors and edited their work. Managing Editor (May 1998-May 1999): Oversaw editorial content, including developing columns and features, assigning articles, copyediting, hiring columnists and trafficking all materials for each issue. Wrote articles, table of contents and cover copy. Broadway Editor (August 1993-August 1998): Coordinated and directed Broadway department editorial and production. Proofread and copyedited Broadway programs. Supervised Off-Broadway program department. Suggested, researched and wrote articles. Monthly travel columnist. Off-Broadway Editor (December 1992-August 1993): Oversaw entire Off-Broadway department including editorial, production and billing. Edited and fact checked all Off- Broadway programs. Worked extensively with press agents, producers and theatre managers throughout pre-production and run of theatrical event. Editorial Assistant (July 1992-December 1992): Organized and researched data for special reference issue that detailed products and their capabilities in LAN performance and productivity. Formulated, compiled and proofread buyer’s guide charts. Develop curricula for mass media and copy editing classes, including all course materials. Teach mass media and copy editing. Teach continuing education classes in creating websites, magazine article writing as well as travel, business, memoir, resume and romance writing, playwriting, creative nonfiction, blogging, writing for the web, and interviewing. Teach beginning and advanced reporting, history of journalism, producing for the web, producing the newscast, writing for electronic media, feature writing, writing for the environment and introduction to media for a 14-week semester. Update curriculum and program as industry and educational changes necessitate. Spearhead recruitment efforts such as “Spend a Day with a Major” program and the Best of High School Journalism Awards. Plan and coordinate monthly Food for Thought lecture series. Speakers from various media, including Fox News, Newsday, Los Angeles Times, Lifetime Television, New York Post, etc. Schedule classes, hire adjuncts, offer supplemental advising to students, organize new initiatives for the journalism department, such as embedding Patch.com and Yahoo! Contributor’s Network into existing curriculum. 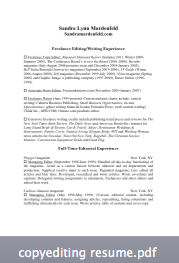 Download a PDF of Sandra Mardenfeld’s copy editing resume.